The sea breeze greets you when you get off at the Hyannis Transportation Center. Another in a series of New England getaways on public transportation. The CapeFlyer will run at least through Labor Day. Trains depart South Station on Friday at 5:12 p.m. and on Saturday and Sunday at 8 a.m. Return trains leave Hyannis at 6:30 p.m. on Saturday and Sunday. 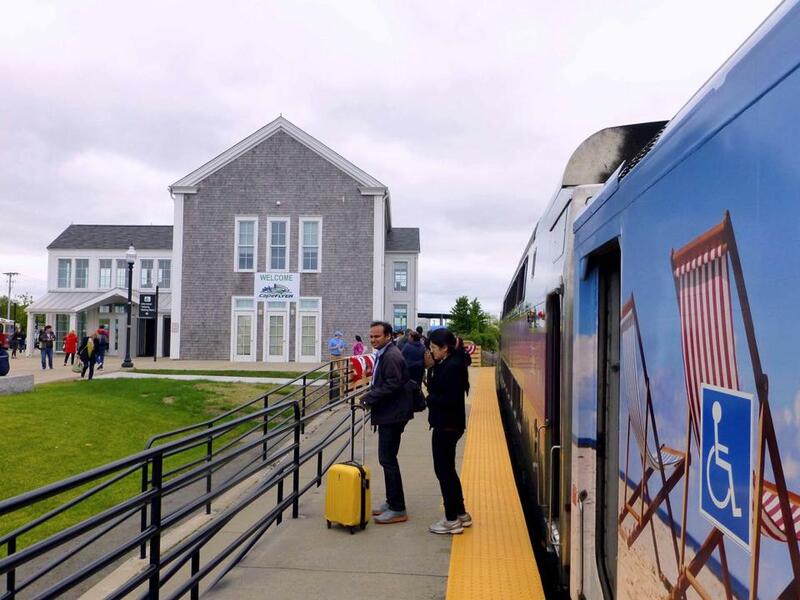 (For those who stay all week, there’s a Hyannis-Boston train Friday at 8:30 p.m.) Travel time is roughly 2½ hours aboard double-decker commuter rail cars. One hybrid car has racks for about 30 bicycles (free, first come, first served) and a snack bar. On most trips, passengers can also chill with wine, beer, Bloody Marys, and Cape Codders. 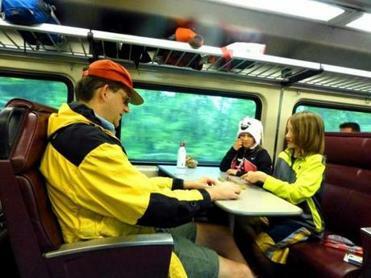 Father Matthew Valencius played cribbage with his children, Zara and Casimir, on the CapeFlyer train heading to Cape Cod. South of the Middleborough station, the Flyer leaves the suburbs behind for views of cranberry bogs and marshes. At the Buzzards Bay stop, some passengers jump out to the platform for a better view of the railroad bridge and hop back on for the ride over. Once on the Cape, the train follows the canal and skirts the incredible salt marshes of Sandy Neck. Since no one has to keep their eyes on the road, everyone can enjoy the scenery. The train arrives at the Hyannis Transportation Center, where buses connect with other Cape towns. On Friday nights, for example, the Plymouth & Brockton Street Railway Co. (508-746-0378, www.p-b.com, round-trip $7-$18, bicycles $5 each way if space permits) heads to the outer Cape. It’s about 50 minutes to Wellfleet or 80 minutes to Provincetown. On Saturdays and Sundays, Cape Cod Regional Transit Authority (800-352-7155, www.capecodrta.org, per ride $2, age 60 and over $1, free but limited bike space) buses reach Dennis Port in 45 minutes or the Chatham rotary in 70 minutes. For freedom from bus schedules, reserve a car from Enterprise Rent-A-Car (508-778-2205, www.enterprise.com, starting around $40 per day) and it will be waiting for you at the Transportation Center. But, in the true spirit of a hassle-free getaway, stay in Hyannis and dedicate the travel time that you’ve saved to simply enjoying summer. As Cape Cod’s commercial hub, Hyannis is often overlooked by vacationers, but it has plenty of diversions. From the Transportation Center, a weekend trolley (free) makes a loop about every 30 minutes that covers the downtown, the harbor, and Kalmus Beach, which is well equipped with lifeguards, bathrooms, and a snack bar. The downtown and harbor area are compact enough to cover by foot. The shops and restaurants of Main Street are literally around the corner and it’s a 10-minute walk to the harbor. A bicycle is another good option to reach the beach. Rent one at Bike Zone (323 Barnstable Road, 508-775-3299, www.bikezonecapecod.com, from $20 per day) and helpful staff will direct you to Kalmus Beach (a leisurely 15-minute ride) and recommend a safe and scenic route to the picturesque village of Osterville. .catboat.com, adults $35, over 62 $30, children $10) time one of their cruises to sunset. If you have little ones along, they can dress like pirates and search for hidden treasure aboard the Sea Gypsy (Ocean St. Dock, 508-394-9100, www.pirateadventures.com, $22.50) and take a few spins on the sweet carousel at the Funhouse Arcade (541 Main St., 508-790-0167, $3). Two museums are great for a rainy afternoon. The Cape Cod Maritime Museum (135 South St., 508-775-1723, www.capecodmaritimemuseum.org, adults $5, students and seniors $4, 7 and under free) recounts five centuries of local history on the water. One man’s personal relationship with the sea is explored at the John F. Kennedy Hyannis Museum (397 Main St., 508-790-3077, www.jfkhyannismuseum.org, adults $8, over 65 $4, 10-17 $3). Judging by all the restaurants on Main Street, breakfast is the most important — or at least most popular — meal of the day in Hyannis. The Daily Paper (546 Main St., 508-775-9711, www.dailypapercapecod.com, $4-$11) serves everything from lobster benedict to banana and candied walnut pancakes. For casual harborside dining, Spanky’s Clam Shack (138 Ocean St., 508-771-2770, www.spankysclamshack.com, sandwiches and entrees $9-$30) is a good bet for fish and chips or whole belly fried clams. Round-trip fares from South Station to Hyannis are $35 (one-way fares are $20). Kids 5 and under ride free. Tickets can be purchased at South Station, with the MBTA mTicket mobile app, online at www.mbta.com, or from the conductor on board the train. Details are spelled out at capeflyer.com.